The original performance clutch that offers 30% more holding capacity than a stock OEM clutch while maintaining a stock pedal feel. 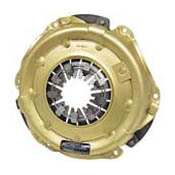 This system is recommended as the finest quality upgrade from an OEM clutch. It does actually lessen foot pedal pressure, for awhile at least. Fragile. Have owned many. Centerforce NEVER accepts responsibility. The guy with the '67 Chevelle SS has nothing on my '68 427 Corvette. He's putting out 500 hp, and that's pretty good. But I'm putting out 630 hp. His assessment that Centerforce is only suitable for 4 bangers is patently false. I have 500 miles on my engine and clutch now. The engine is barely broken in. During that period of time, the clutch worked and felt like a lighter clutch because of those weights. Today, no burn outs. No fanfare. Just accelerating in first and second gear up to 55 at full power and I smell clutch smoke...BAD. I can't believe the Centerforce dual friction clutch is failing to hold this engine's power when they advertise that it's the best racing clutch around, yada yada yada. And I'm no stranger to Centerforce clutches either. I've had several over the years in a turbocharged 1986 Shelby Charger...which is a 4 banger. Every one of the 4 or 5 clutches I've had in that car has either physically broken, lost its weights, had pad material separate, or burned up. And every single time, Centerforce would absolve themselves of ALL responsibility, blaming it on installation, or misalignment, or not a good enough flywheel, etc. Isn't it funny that so many other clutch manufacturers don't make excuses like these guys, nor suffer so many failures. So yeah, after only 500 miles, I've got to change out a clutch that easily cost nearly $500, and get a new one. This was the last Centerforce I was going to try using, and I was worried about installing it. I don't know how much longer it will work, so I'll have to keep it minimal. I took it on a gentle drive with my wife again tonight, and again it smells burnt, although for now it is still gripping. So to Mister Chevelle SS...don't worry. Yours will fail too. Mine only went 500 miles. You might get a little more, but you'll be singing a different story when they let you down too. How are these guys still in business??? Whoa i cant beleive these guys are still in business. Got a stage 2 after i had to replace the stock clutch on my supercharged 07 V6 mustang. Like others i beleived the hype. Bad idea. First one (thats right there is more than one) started slipping really bad at about 4000 miles and car became almost undrivable at about 6000 miles. So i took it back to the shop and told them to fix it. They called centerforce, luckily the shop owner is on a first name basis with somebody over there, so they told him i didnt get one with enough pressure therefore it wore out very fast. Stage 2 not enough on a 320 hp car??? give me a break. They then said they would put a new friction material on it for 200 bucks so i just did that instead for forking out money for a brand new one, couldnt afford to go new to a different company. So the new one holds for about 4 months, about 8000 miles and one day i drive to the gas station, fill up, get back in start my car and boom my pedal wont come up off the floor. like a limp noodle just laid there dead. got the car towed back to the shop again. Now centerforce who wanted the shop to send in measurements of flywheel and some toher things after sending it back to them to inspect again is telling me its my flywheel. So i get a new SPEC billet aluminum flywheel. Shop reinstalls clutch and flywheel and they call me and tell me something is still up. At this point im about ready to freak out. So the shop calls centerforce back and says something is out of whack with the clutch its still not working. So now i have to wait another week making it about 3 weeks without a car so they can send it back again since centerforce neglected to fully inspect there product, so quick to point the blame at the flywheel, and want to do a full inspection this time. Never again ive asked the shop to try and refund most of not all of the money spent on that P.O.S. I beleive this is one of the worst products somebody could put into there vehicle. whether you have a stock to heavy modded machine. I installed the clucth on a new motor, transmission, flywheel etc. I wanted the best and they sure made it sound like it with their new weight system. I broke in the engine and rove my car 300 ft and had the clip that holds the weights break. The clucth was left jammed open. I purchased this clutch a year earlier so of course the wrranty is over. STAY AWAY FROM THE WEIGHT SYSTEM >>>> IT IS JUNK AND LEADS TO MORE PROBLEMS !!!! looks good out of the box, all orange colored. I installed a Centerforce DF clutch on my 2004 Dodge Ram 2500 diesel at 95K miles, about 5K miles back. I drive it to work daily and tow my bass boat (trailer and boat, about 3500 lbs) on weekends. The stock clutch never gave a problem in 95K miles. I followed the recommended breakin for 500 miles, stop and go. Pulled the boat the first time around 750 miles. Clutch isn't slipping - yet - but perdal force is gradually increasing and when backing the boat the clutch smells like its burning up. I called tech support; no help there. Thier attitude was, "you bought it, you own it". Their so called "diagnosis guide" showed pics of every imaginable clutch failure along with a disclaimer on each "this isn't covered in warranty". Apparently if it fails it's not covered. In my opinion this clutch is not suitable for towing applications. Might work on the drag strip, but not on a truck. Judging by the burning smell I doubt it'll last 10K miles on my truck. I'll replace it soon with a STOCK clutch, which costs half as much and performs much better. Center Force is still in business. After my stock '06 Tacoma clutch started going out, I decided to replace it with an upgraded clutch. Had a repair shop install the Center Force Stage 1 kit, and right off the bat had problems. Each time I drove the clutch would burn - badly, to the point of severe smoke. Finally the repair shop broke apart the truck to find that the clutch disc was so badly burned it had holes in it. The culprit...a badly warped pressure plate. Got NO help from Center Force, they blamed it on improper installation. "Hey Center Force, soon you won't have to worry about these complaints, 'cause no one will buy your crappy product!" Everything about it. It's even an ugly Home Depot orange. Not pretty like a Chevy orange. I expected much more. I never wanted to do another clutch in this car so I bought the best I could find, or so I thought. It held the power ok, but it is only 220hp (advertised). The pedal was firmer then stock and it was difficult to slip it easily in traffic. It lasted a little over 12 months and about 14,000 miles. It started to slip noticably at the end. When I pulled it out, the bell was full of carbon dust, the flywheel was etched about 15 thousands, the pressure plate side was on the brass rivets, and the throwout bearing had worn half way through the diaphram fingers. If you think that maybe I didn't adjust it correctly, well, it's a self adjusting, constant contact system. It adjusts itself. I have done about twenty clutch installations on my own cars over the years. If I didn't do this one right then there isn't any hope of getting it right. The only conclusion that I can come to is don't ever buy a Centerforce clutch again. It is increadably overpriced. It is increadably over rated. I went back to a stock Ford clutch and am glad that i did. Also, don't expect any kind of help from Gene at Centerforce. Apparently there isn't anything that they did wrong with the clutch. This is considered "normal" wear. Bye, bye, Centerforce. You have lost me FOREVER as a customer. Umm, hi tech? with the little kevlar and copper-wire pads on the flywheel side? What happened to the clamping force? I can push the clutch pedal to the floor with my hand. Try that with the old centerforce II, it won't happen unless you're Arnold Swartzennegger. I let it break in for 500 miles before I used any boost at all on the engine. It has stock pedal pressure all the way thru the RPM range, so how can it handle more power than stock? It didn't. The clutch will break loose at high rpm in any gear, even on a soft launch. I'm putting out less than 200hp, running 15.3 sec 1/4 mile times, and the clutch is my limiting factor. I just pulled the clutch/flywheel and the disk and flywheel are fine. The wear pattern on the disk is smooth and even, with over 90% of the clutch disk in contact with the flywheel and plate. This clutch is broken in. The clutch plate has little spotty burn marks in a ring toward the outside. My flywheel has a small step in it that adds artificial height to the clutch disk. I am having the flywheel re-machined, and the height of that step will be doubled in hopes to add clamping pressure and make this wimpy thing hold. I have now sanded the clutch plate with 240 grit to remove all the burn marks. I have sanded the disk to a rough, not shiny surface. I am getting my machine work done tomorrow, so hopefully I will have more clamping force. I will re-install the clutch, re-break it in and see what happens. I am worried now, because I bought two Dual-friction clutches at the same time.... this one for my street car (180-200hp) and one for my race car (350+hp). If I can't get the street car solid, then what chance is there that the race car will hook up? Centerforce II old-school. I bought one 10 years ago. That one had GREAT clamping force I liked it a lot and several other people liked it and BOUGHT them on my reccommendation. Comes in a Nice box. Stock pedal feel. Will make the Slave a Clutch cyl last a long time. Cheap Korean Disc. Just a stock clutch w/ weights that only really work at high RPMs.